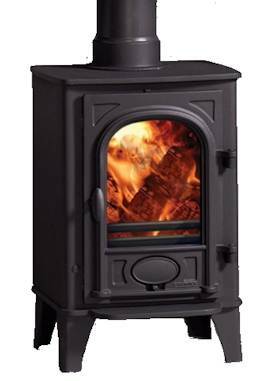 Choosing and using a wood burning stove. The cleaner, greener way to heat your home and add a cosy atmosphere. Our stove is black and so the outside needs little more than an occassional dusting. Once I accidentally managed to scrape against the metal and left a silver sheen that rubbing wouldn't remove. I asked the man who sold the stove to me and he showed me a neat trick. Simply respray the offending area with the blackfireproof paint they use in the showroom. In short, there is no problem with the cast iron bits of a woodburing stove at all. Cleaning the glass door of your woodstove does need to be done regularly. Each time you light your fire a film of soot lands on the glass and is then baked on by the heat of the fire. For the first few moths we were using a chemical spray to clean the soot off and while this worked fine, it also had us concerned for the ozone layer and our lungs. Then a friend showed us this brilliant trick. All you need to do is dampen some scrunched up newspaper and dip it in some cold ash and then wipe over the glass. The ash turns to soap and the glass comes up beautifully clean. Most people think the annual visit from the chimney sweep will make the place a total mess. Nothing could be further from the truth. A good sweep will take less than 20 minutes and when he has finished his work the house will be as clean as it was when he arrived. If this is not the case for you, all I can suggest is that you find a different chimney sweeper. When you open the door a few specks of ask generally get blown out into the room but the problems can occur when you empty the ash from the fire grate. My technique for emptying the ash is to dampen it slightly before shovelling it out into a newspaper. Don't throw the ash in the trash, put it on the garden around the roses or into the compost heap and recycle it. We have a black slate hearth which can be brought back to a showroom gloss very easily. After cleaning with a damp cloth simply spray a little WD40 across the surface and wipe in using kitchen paper. The oil forms a thin protective layer on the stone and brings back a mirror-like shine.